Thanks to a glut of stupidity on the part of other people I am slowly moving down the Moron Board and with any luck should be off the board entirely in just 6 more acts of moronic behavior by anyone other than me. 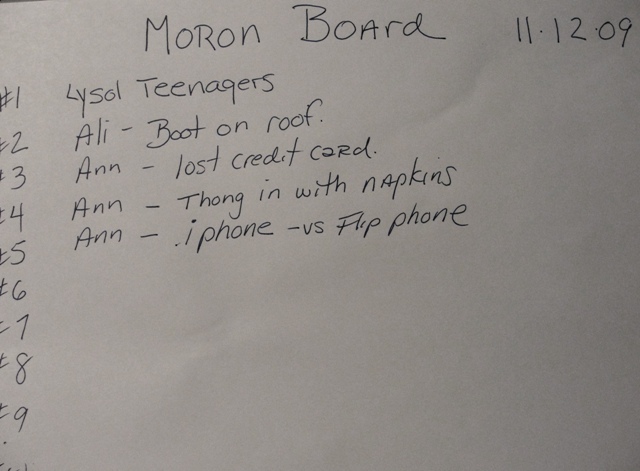 The latest addition to the Moron Board involves a friend’s teenage children. When she returned from the store the house smelled a little like smoke and a lot like Lysol. Thinking they were smoking cigarettes should called them on the carpet and grilled them about the smell. Guilt persuaded the younger of the two to fess up that they had tried to make a fire in the fireplace but the room started to fill up with smoke. Opening the flu would have been a solution to this problem but then we are dealing with… you got it, teenagers, who know everything about everything and therefore always make it onto the Board for reasons they cannot explain or understand. That is why they are teenagers. Anyway, back to the story. Apparently, in an effort to hide the smell of the fireplace smoke they sprayed Lysol around the room and after putting water in the fireplace they sprayed the Lysol directly on the smoldering fire as well. They are darn lucky that the fire was out as they would have blown there little heads heads off. Who would ever spray anything from an aerosol into a smoldering fireplace.? Morons, that’s who! And so now these two will be at the #1 Slot on the Moron Board. Until another one takes there place. My friend says she would have preferred that they were smoking!